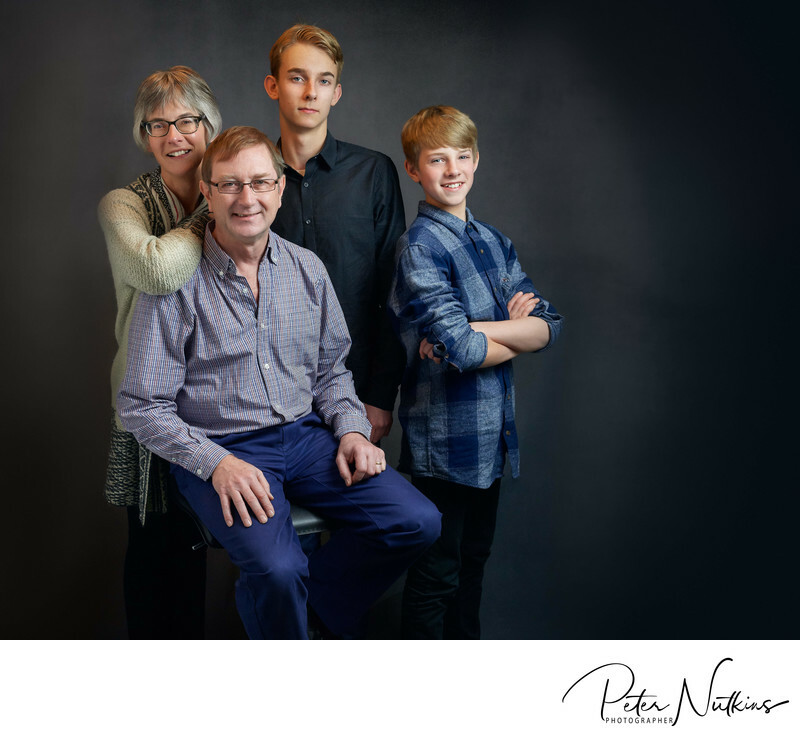 I am Peter Nutkins, Exeter's specialist family portrait photographer who comes to your home (or your favourite location) to capture beautiful portraits of you and your loved ones. No need to travel - it is so simple when I come to you. When I first meet up with a new client it gives me the opportunity to find out all about them and exactly what they are looking for in their portraits. I also take note of the surroundings and quickly look at how creative we can be in the space that they have. Most of my clients are looking for beautiful family portraits, individual portraits of each member of the family as well as a group photograph. Usually at least one member of the family is also requiring some business imagery (personal branding for example). Once the memories have been captured and the portraits printed as fine art pieces the family can choose which of the portraits they would like to keep in their walnut portfolio box. Often multiple copies of the main portrait are often given to grandparents or other relatives. Once you have booked your portrait photoshoot you will be given an online portal. This is like a mini website all of its own where everything connected with your portraits is connected. You will find your galleries, invoices, contracts, design proofs and other documents easy to hand. You will also have all of the information about your portrait session. This fine art portrait is a typical example from one of my family portrait sessions. Although this family photograph may look as though it has been taken in a studio it was in fact captured in the dining room of a home! To achieve this ‘studio style’ I bring the backgrounds, props and lights to the comfort of your own home. This family were so kind and thoughtful. We had met a few weeks before when I met both the boys and their pet dog (not pictured here). We talked through what the family were looking for and also found out about the interests of the two young men. When I returned for the photo shoot we could pick up our conversation from where we left off. This broke the ice straight away and enabled everyone to be more relaxed much quicker. Originally we had talked about some outdoor portraits, but on the day it was too cold for people to really relax. So we decided to work indoors - with a little furniture rearranging we were all set to go. I think that this image gives you a good idea of exactly why I come to your home rather than you coming to a studio. Because my portrait sessions take place at your home you can easily get changed into a range of clothes and try different looks and styles. Because we are in your space you feel so much more comfortable. I am a visitor, not you. This is especially effective when children are taking part in your photoshoot. They can come and go as needed and have easy access to their own toys, snacks, games and clothes. You can imagine that this reduces the stress on you considerably and that means that your portrait will be better too. You can pop in the kitchen and have a cup of tea while I am capturing your children interacting and having fun with each other. Most families are looking for a range of different memories. Each member of the family has their moment of glory when they have pride of place and I work with them to get the best way of standing and posing. Then we get small groups together, Mum and Dad, the children, grandparents and so on. Finally, we have the full family. By this time everyone is relaxed and knows just what to do to get a great portrait. Exeter Family Portrait Photographer now all across the UK! I come to your home basically anywhere in the UK. England, Scotland, Wales or Northern ireland. If you are in the UK then there are no travel expenses and I can be at your home, workplace or favourite location on a date that is good for you (as long as I am available). If you live outside of the UK then I do make an additional charge for travel and accommodation.